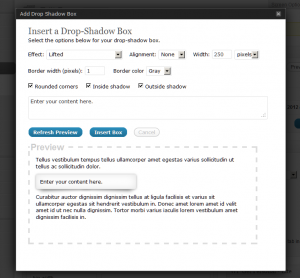 Wordpress admin can now add boxes with drop shadows to posts, pages and widget areas! Drop Shadow Boxes provides an easy way to highlight important content on your posts, pages and widget areas. Personalise the box with drop shadow effects like raised, lifted and perspective and choose whether the box has an inside shadow, outside shadow and rounded corners. The plugin includes a widget and shortcode builder with a preview so you can test your box before adding it. The shadows will display correctly on most browsers – some older version of Internet Explorer may not display the shadows – but they will display the box with the content so nothing will be missing on the page. The plugin itself doesn’t require any configuration. There isn’t a setting page. You can access the widget from the Widgets dashboard page – drag, drop and configure as you would any other widget. 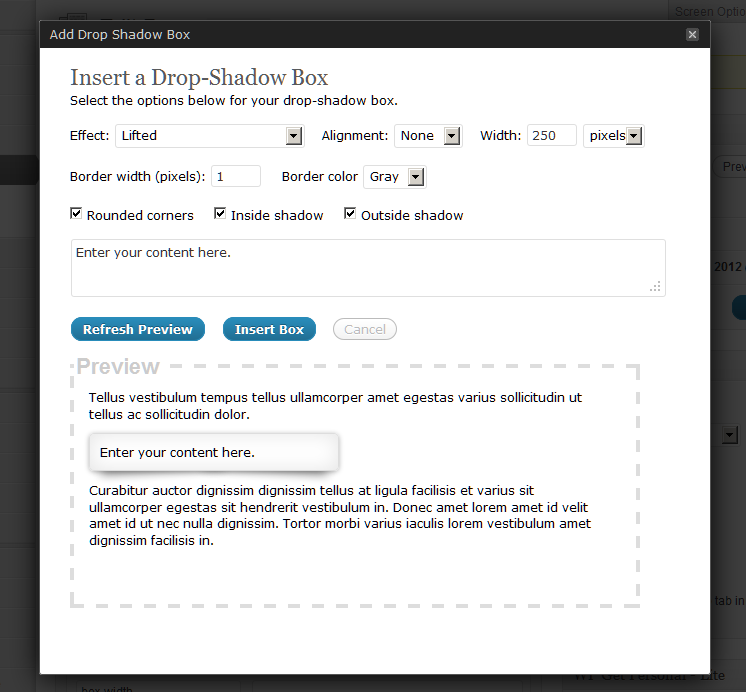 The shortcode builder allows you to add Drop Shadow Boxes to posts and pages. You can access from the media toolbar while you’re editing the post/page by clicking on the box icon next to the upload/insert media button. If you prefer not to use the shortcode builder, or if you’d like to modify an existing drop shadow box here’s the shortcode reference guide. Drop Shadow Boxes is currently available in English and Spanish (es_ES). The shortcode builder will automatically switch to Spanish if your WordPress installation is in Spanish (es_ES). If you’d like to contribute other languages please get in touch. If you find any that needs fixing, or if you have any ideas for improvements, please get in touch. Please also get in touch if you’re using the latest version of your browser but the shadows are not displaying. 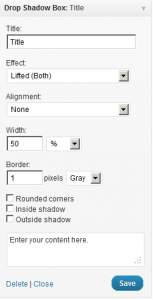 You can use the widget for widget areas or use the shortcode builder on posts and pages. While you’re editing a post or page you can open the shortcode builder by clicking on the box icon next to the upload media button above the toolbar. Once you’ve added the shortcode to the page/post you can edit the contents just like any other content. Align the second box left. The shortcode builder offers quite a few options. If you need further customisation you’ll need to over-ride the css classes in your theme (usually style.css). The css file will only be loaded when it’s needed – when there’s a [dropshadowbox] shortcode on the page or post or a widget in a widget area. No. It uses CSS3 only. If you like it , please give it a rating – thank you!